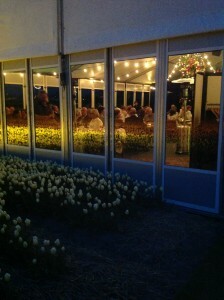 After two successful years of Dining in the Tulip fields, this year however we will be dining in the Hyacinth fields. A chic tent will be placed in a beautiful flowering field at the Spieringweg. In these tents restaurant t’Fort will serve a delicious lunch or dinner, during which you will be able to enjoy the view of the flowering Hyacinth fields. Between the courses you will be informed about flower bulbs and their cultivation. At a unique location, with delicious, surprising food and a beautiful view, this is an event you don’t want to miss. We are looking forward to it. It will take place from April 12th to April 15th.